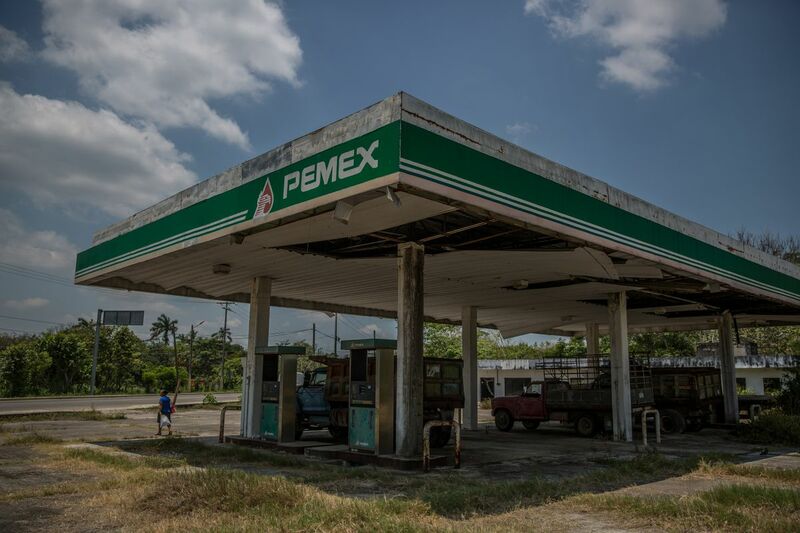 An abandoned Petroleos Mexicanos (PEMEX) gas station stands in Nacajuca, Mexico, on April 19, 2018. Bloomberg photo by Alejandro Cegarra. MEXICO CITY - Gloria González considers herself left-leaning and socially minded. She has marched in protests, supported environmental causes and voted three times for President-elect Andrés Manuel López Obrador - the left-leaning populist and nationalist who overwhelmingly won the July 1 election. González, 50, doesn't own a car. But she hopes López Obrador keeps key campaign promises: to freeze the price the gasoline and build an $8 billion refinery. "When the price of gasoline goes up, the price of food goes up, too. Bus fares go up. The price of everything goes up," she said. "He wants to build refineries. He wants them to benefit the people [with] a lower price of gasoline." López Obrador - who also goes by his initials, AMLO - campaigned on curtailing crime, corruption and poverty. He also promised to clean up the environment, releasing a campaign document called "Naturamlo," which pledges to protect water resources, plant 1 million hectares of trees, consult with indigenous communities on development and stop the slayings of environmental defenders. But any environmental agenda intersects with Mexico's complicated relationship with petroleum. In 1938, the state seized nearly all the assets of foreign-owned oil companies, effectively nationalizing the industry. Patriotic Mexicans donated everything from the family jewels to chickens to help the government get rid of the foreign companies. That history has left many Mexicans with a sense they should benefit from petroleum by paying less at the pump. It has also prompted López Obrador to promise he will "rescue" the energy sector. López Obrador, a native of oil-rich Tabasco state, has obsessed for years over the price of gasoline and opposed a 2014 constitutional change that allowed foreign companies to invest in the oil and gas industry. He compared the change to treason and wrote a letter warning then-ExxonMobil CEO Rex Tillerson that any investment in Mexican oil would be tantamount to "piracy" - although he toned down his rhetoric in the pre-election period. 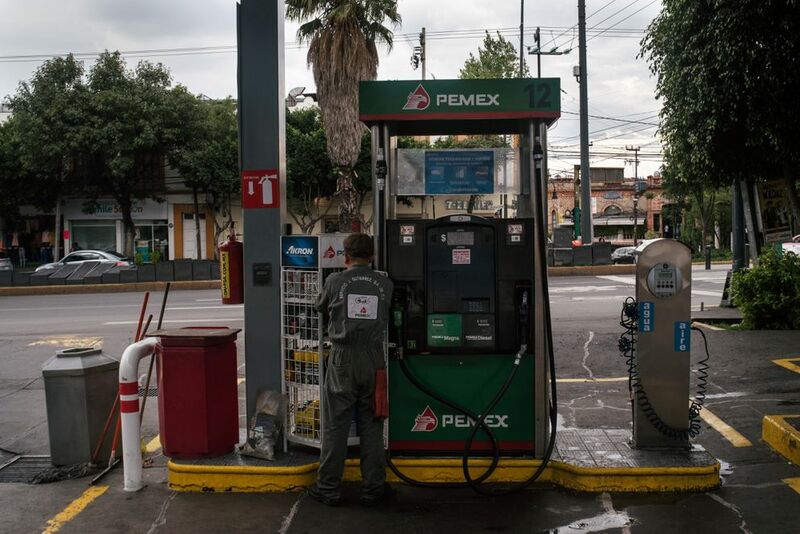 An attendant stands next to a fuel pump at a Petroleos Mexicanos (Pemex) gas station in Mexico City on Aug. 6, 2018. Bloomberg photo by Luis Antonio Rojas. López Obrador has proposed freezing the prices of gasoline, diesel and electricity for three years, then lowering prices as new infrastructure comes online. In a meeting with business leaders in Monterrey on Tuesday, López Obrador said the refinery, located in Dos Bocas in Tabasco, would cost $8 billion and would produce 600,000 barrels of gasoline per day. The refinery is part of his ambitious, $9.2 billion investment plan for Mexico's state-run oil and electricity companies. The investment aims to boost petroleum production, which has fallen 43 percent since peaking in 2004, refurbish neglected refineries operating below capacity and bolster electricity generation. López Obrador's transition team did not respond to requests for an interview. The president-elect has said he will ban fracking, and in the presidential debates he proposed combating climate change by planting 1 million hectares of trees and increasing hydroelectricity production. His transition team has also pledged to respect Mexico's international climate commitments and promote the use of renewable energy, according to clean-energy consultants. Analysts say increasing refining capacity makes sense after decades of underinvestment by the state petroleum company, Pemex. Environmentalists express mixed opinions on the incoming administration. Most are taking a wait-and-see approach. "We have some mixed signs," said Andrés Flores, director of climate change and energy at the World Resources Institute in Mexico. "They've announced new refining capacity, investments in oil and gas, and on the other hand they're also saying they would comply with the commitments that Mexico made in the Paris [climate change] agreement." Outgoing President Enrique Peña Nieto passed energy reform early in his administration to boost oil production, attract investment and take advantage of oil giants' expertise in exploiting deep-water petroleum. He sold it to skeptical Mexicans with the promise that they would pay less - only to have worldwide prices for gasoline spike. A "gasolinazo," or mega-hike, hit consumers in January 2017 as the government loosened its control on prices at the pump, prompting street protests. Peña Nieto pleaded for calm in a nationwide address, explaining the taxes on gasoline paid for education and social programs. "What would you have done?" he asked an outraged population, who responded with snarky responses such as "resign" as graft scandals engulfed governors in Peña Nieto's party. "We're paying tax on gasoline that we shouldn't be paying," said Rocio Morales, a pawnshop owner who voted for López Obrador. "It's a lie that this money goes to social programs. If you go to a hospital, there are no medicines there. There are no computers in the schools." 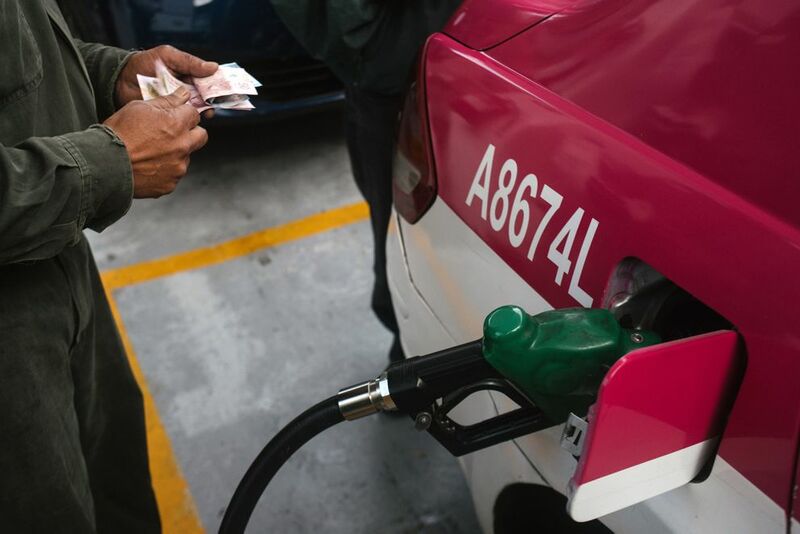 An attendant fuels a taxi while counting money at a Petroleos Mexicanos (Pemex) gas station in Mexico City on Aug. 6, 2018. Bloomberg photo by Luis Antonio Rojas. Mexico's obsession with gasoline prices started in the 1980s, when hyperinflation was rife, said David Shields, publisher of Energía a Debate, which focuses on Mexican energy issues. "Every time the gasoline price went up, people associated this with inflation and the shortage of products in supermarkets," Shields said. The government started setting the price in 1992 as an inflation-control mechanism. Under the scheme, gasoline often cost less in the United States than Mexico. But when world oil prices soared, Mexico had to subsidize gasoline - to the tune of more than $20 billion in 2008, more than it spent on its flagship anti-poverty program. Vehicle ownership has also increased - driving the demand for gasoline higher - climbing from 39 percent of households having a vehicle in 2000 to 46.5 percent of households in 2010 in Mexico City, according to census data. It's the product of a larger middle class, lower prices from automakers and an expansion of credit, analysts say. Combating climate change can be a tough issue to promote in a country where owning a car represents social mobility and public transport is perceived as uncomfortable and the conveyance of the poor. "A car is a status symbol and a sign you advanced," said Emiliano Ruiz Parra, a journalist who has closely covered López Obrador for years. "In a city without decent or dignified public transport . . . everyone wants a car and dreams of having a car." Equally challenging for climate advocates is getting the incoming administration to a see the shortcomings of building a new fossil fuel refinery instead of investing more in renewable energy.